WILMOT, Wisc. - July 30, 2016 - David Gravel has been under the weather over the course of the last week, but he didn't let that slow him down on Saturday night in the O'Reilly Auto Parts Badger 40 at Wilmot Raceway in Wisconsin. The native of Watertown, Connecticut, led all 40 laps to claim his sixth World of Outlaws Craftsman® Sprint Car Series win of the season. "It's been a rough last six or seven days for me and I'm just starting to feel better," said Gravel, who drives the Big Game Treestands machine for CJB Motorsports. "The car was just awesome. I've only had one other car ever that has driven perfect like that. There was a lot of yellows and that gave Donny (Schatz) a lot of shots at me and chances to try to change it up a little bit." "Some yellows helped me not have to deal with lapped traffic," explained Gravel. "There at the end, I passed a couple of lapped cars and had a pocket with about five to go. I think I saw Donny poke his nose, and I knew I had to get going and that gave me a little cushion. Our car was so good on the top that it just drove itself, really. Typically, we struggle on restarts with tire pressure and laying over on the right rear. That car was great tonight." "I wanted to beat the five wins I had a few years ago and did that tonight," he noted. "Hopefully we'll be able to keep this rolling the rest of the year." The race got off to a rocky start, with the yellow flag waving three times in the first dozen laps. The first yellow of the race came out on the second lap, when Jacob Allen, who was running second, spun. Just past the halfway point of the race, while in traffic, Schatz was able to get his nose under Gravel in turns three and four, but wasn't able to make a pass. The final 19 laps of the race went caution-free, putting the leaders into lapped traffic, some of which was heavy at times. "I'm happy to get a good finish," said Schatz, driver of the Bad Boy Off-Road J&J for Tony Stewart Racing. "Riding the rim is not really my game, but I can make it my game if I have to. I just kind of bouncing off the cushion in (turns) four and two. I thought I had a good shot at him, but if I got off the cushion, I couldn't go anywhere. Getting there was one thing and passing was another." 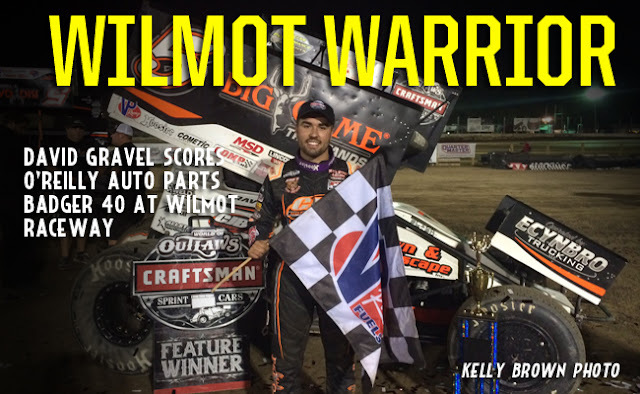 The O'Reilly Auto Parts Badger 40 wrapped up a busy month of July for the World of Outlaws Craftsman Sprint Car Series and Schatz finished first or second in 10 of 13 races in the month, with his lowest finish in that span being a seventh-place effort. "These guys did a pretty good job here and we had an incredible July," said Schatz. "Tomorrow July is over, so the next time we get to race is August and we are worried about the big races next weekend and beyond." "This is a great team and I am lucky enough to drive this car," said Saldana. "Everyone is working hard and we are hanging in there. We are just missing something little. Being on the front straightaway, hopefully you can win some of these races. We'll keep doing what are doing and try to stay as positive as possible. It's easy to get down and beat up. We'll take this and go on to Pevely and hopefully get a couple of spots better." The World of Outlaws Craftsman Sprint Car Series enters the final stretch of the 'Month of Money' on Friday, Aug. 5 as the series kicks off the Ironman weekend at Federated Auto Parts Raceway at I-55 weekend. For more information and to learn how to purchase tickets, visit WoOSprint.com/Ironman-55. RACE NOTES: David Gravel scored his second career win at Wilmot Raceway on Saturday night. He has the last two victories for the series at the track… Leading rookie of the year candidate Greg Wilson was the night's KSE Racing Hard Charger, advancing eight positions to finish in ninth… Brad Sweet picked up his ninth quick time award of the season. He is now one quick time away from matching the season's leading qualifier Joey Saldana… Outlaws drivers occupied all the first 12 finishing positions. CONTINGENCY WINNERS - MSD Ignitions ($25 cash): Matt Vandevere; MSD Ignitions ($50 cash): David Gravel; Penske Shocks ($50 cash): Donny Schatz; JE Pistons ($50 cash): Daryn Pittman; VP Racing Fuels ($50 cash): Jason Sides; Edelbrock ($50 cash): Greg Wilson; Comp Cams ($50 cash): Logan Schuchart; Morton Buildings ($50 cash): Paul McMahan; Cometic Gasket ($50 cash): Jacob Allen; Super Flow ($50 cash): Ben Schmidt; Craftsman/Sears ($100 cash): N/A; KSE Racing Products ($100 product certificate): Greg Wilson; Comp Cams ($50 product certificate): David Gravel; JE Pistons (Set of Rings): Dane Lorenc; JE Pistons (Set of Rings): Matt Vandevere. SEASON WINNERS: Donny Schatz - 16 (Volusia Speedway Park on Feb. 14, The Dirt Track at Las Vegas on March 4, Stockton Dirt Track on March 18, Stockton Dirt Track on March 19, Silver Dollar Speedway on April 2, Lincoln Speedway on May 19, Weedsport Speedway on May 22, Lincoln Park Speedway on June 8, Knoxville Raceway on June 11, River Cities Speedway on June 17, Rockford Speedway on June 29, Badlands Motor Speedway on July 3, Cedar Lake Speedway on July 9, Attica Raceway Park on July 12, Eldora Speedway on July 16, Ohsweken Speedway on July 26); Brad Sweet - 7 (Volusia Speedway Park on Feb. 13, Volusia Speedway Park on Feb. 14, Cotton Bowl Speedway on Feb. 26, Ocean Speedway on April 1, Bakersfield Speedway on April 15, Plymouth Speedway on May 13, Badlands Motor Speedway on July 2); Daryn Pittman - 7 (Royal Purple Raceway on Feb. 27, Perris Auto Speedway on April 16, USA Raceway on April 18, New Egypt Speedway on May 24, Jackson Motorplex on June 24, Eldora Speedway on July 15, Williams Grove Speedway on July 22); David Gravel - 6 (Thunderbowl Raceway on March 12, Tri-State Speedway on May 14, I-96 Speedway on June 6, Eldora Speedway on July 14, Lernerville Speedway on July 19, Wilmot Raceway on July 30); Shane Stewart - 5 (Arizona Speedway on March 6, Devil's Bowl Speedway on April 23, Lawrenceburg Speedway on May 30, Granite City Speedway on June 15, Brown County Speedway on June 19); Joey Saldana - 4 (The Dirt Track at Las Vegas on March 3, Devil's Bowl Speedway on April 22, Jacksonville Speedway on May 4, I-80 Speedway on June 22); Lance Dewease - 2 (Williams Grove Speedway on May 20, Williams Grove Speedway on July 23); Kerry Madsen - 2 (Eldora Speedway on May 6 and 7); Bill Balog - 1 (Beaver Dam Raceway on June 25); Chad Kemenah - 1 (Fremont Speedway on June 3); Jason Johnson - 1 (Placerville Speedway on March 24);Terry McCarl - 1 (Knoxville Raceway on June 10); Logan Schuchart - 1 (Cedar Lake Speedway on July 9); Jason Sides - 1 (I-30 Speedway on April 26); Greg Wilson - 1 (The Dirt Track at Charlotte on May 27).